In the spring of 2005, my friend Kevin and I grabbed Frosties at a local Wendy’s. As we devoured them, a large African-American man entered and ranted about the evils of the world. Specifically, he went on about white people. Kevin and I found the incident to be perversely amusing… until we realized we were the only white people in the restaurant. Neither of us knows if the guy planned to back up his anti-Caucasian sentiment with actions, but he seemed unstable enough that we high-tailed it out of there. When I mentioned this event to friends, they all stated that it sounded like this guy had seen and been influenced by the movie Crash. Could be – or he could have just been a racist nutbag. Whatever the case, this incident prompted me to see the film. Crash doesn’t boast a traditional narrative, as instead it shows intermingling events that occur over a 36-hour period in Los Angeles. We follow a slew of characters that include cops and civilians. In the former category we meet black Detective Graham (Don Cheadle) and his Latina partner – and occasional lover – Ria (Jennifer Esposito). They investigate a cop-on-cop murder that becomes complicated. We also encounter white street officers Ryan (Matt Dillon) and Hanson (Ryan Phillippe). They become part of the story after two young black guys named Anthony (Chris “Ludacris” Bridges) and Peter (Larenz Tate) carjack white LA District Attorney Rick (Brendan Fraser) and his wife Jean (Sandra Bullock). Ryan and Hanson pull over black TV director Cameron (Terrence Howard) and his light-skinned black wife Christine (Thandie Newton) because their SUV resembles the one stolen from Rick and Jean. It’s clearly not the same vehicle, but Ryan takes out some racial hostilities as he threatens the pair and body searches Christine in an invasive manner. This leaves them scarred and vulnerable for later in the movie. Those characters account for the bulk of the film, but we also get to know Latino locksmith Daniel (Michael Pena) and Persian shop-owner Farhad (Shaun Toub). Farhad’s shop has a broken door, but he insists he just needs a new lock despite all of Daniel’s statements that the door must be replaced. When thieves ransack the store, Farhad blames Daniel and goes after revenge. That synopsis doesn’t perfectly sum up Crash, as it leaves out a number of characters and situations. However, given the complexity of the melange of events, it’s about as good as it’ll get. I don’t know if the synopsis very well conveys one of Crash’s more absurd aspects, though. How many people live in greater Los Angeles – eight, nine million? All those folks, and yet our little band of characters keeps bumping into each other! It’s amazing – ultra-big-city LA looks more tightly connected than Mayberry. 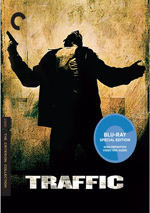 At the movie’s start, the Graham character theorizes that people get into car accidents in LA because the city’s so disconnected; they need the physical contact, violent though it may be. However, the movie sure doesn’t make LA look very detached since the same folks constantly run into each other. I understand that writer/director Paul Haggis stretches credulity to make a point. Really, Crash often comes across more as a plea for racial unity than it does a movie. He interconnects all these disparate lives to remind us we’re all really the same and no one’s without flaws. That’s all well and good, but I’m not sure the movie has much more depth than the Paul McCartney/Stevie Wonder duet “Ebony and Ivory”. I actually inadvertently started to quote that tune since Haggis tries hard to remind us there’s good and bad in everyone. This is true, and it’s nice that Crash doesn’t present characters as absolutes in either direction, but it comes out in a heavy-handed manner. Oddly, the movie leaves little room for thought because of its broadness. Usually films stifle interpretation because they’re one-sided, but here we lose breathing room since the characters can be so undefined. The story demonstrates racist behavior in almost all of them but makes sure it balances it with some understanding. This really should be a good thing, but in this case, it comes across as token and gratuitous. In other words, I just don’t buy it, and perhaps it’s the broad scope of the film that causes problems. It introduces us to so many characters that they barely become more than stereotypes themselves. The movie somewhat embraces what it fights against because it doesn’t have much more time to explore the roles in detail. I don’t want to sound totally down on Crash, as it offers an interesting film. I also respect the fact it tries to do something different and ambitious. However, I think it fails to explore its issues with any substantial depth or intelligence. Despite an outward appearance of complexity, it treats matters simplistically and becomes tough to swallow due to its myriad of coincidences. Crash appears in an aspect ratio of approximately 2.35:1 on this Blu-ray Disc. One of the very first Blu-rays to hit the market, this wasn’t a terrible presentation, but it could use an upgrade. Sharpness created some of the problems. Many shots offered fairly good definition and delineation, but some wider takes could turn rather soft. The clarity varied but usually stayed reasonably concise and accurate. No issues with jagged edges or shimmering occurred. Some graininess popped up due to all the low-light shots, but otherwise the movie was clean and free from flaws. I also saw light edge haloes and some artifacting, with blockiness at times. In regard to colors, Crash went with a stark palette. It mainly stayed with a steely blue tone or a golden impression, though daylight shots tended toward a somewhat overblown white look. Within the parameters, the tones seemed fine, though they didn’t excel. Blacks were a little mushy but acceptable. Shadows tended to be murky and a bit opaque. They abounded and often made the image a little tough to discern. In the end, this felt like a mediocre presentation that would benefit from a new transfer and mastering. Matters seemed less complicated when I examined the perfectly acceptable audio of Crash. The Blu-ray came with Dolby Digital 5.1 EX and DTS 6.1 ES soundtracks, both of which sounded very similar to me. The DTS track may have offered a little more range, but neither really surpassed the other. Music dominated the soundfield, as the ethereal score swirled around the speakers. Otherwise the channels didn’t get much of a workout. Some environmental audio came from the side and rear areas, and these became a little more active during some louder sequences like an explosion, but there just wasn’t much happening. No issues with quality occurred. Speech was concise and distinctive, and edginess was absent. Effects played a small role but seemed accurate and clear. Music demonstrated good range and definition, as the score was well-developed. I found nothing about which to complain here, but the restricted scope of the mix left it with a “C+“. Note that I deducted points due to the absence of lossless audio. Any Blu-ray with only lossy options automatically gets a downgrade. How did the Blu-ray compare to the original DVD? Audio was similar – too similar, since this meant the Blu-ray lacked a lossless option. Still, given the low-key parameters of the mix, the tracks seemed acceptable. Visuals showed minor improvements. The DVD wasn’t great, so even with the Blu-ray’s lackluster qualities, it still worked better than its predecessor. Don’t expect a significant leap in quality, though. While the DVD came with a reasonable array of extras, the Blu-ray omits all of these. It throws in a promo for Lionsgate Blu-ray releases but nothing else appears. I wouldn’t necessarily call Crash itself unmemorable, as the movie’s too ambitious to be discounted. However, I also wouldn’t call it a success. The Blu-ray provides dated picture quality with acceptable audio and zero supplements. Ham-fisted and erratic, Crash keeps us with it but it wears its emotions on its sleeve.